***** a.k.a. - five stars! Never a problem booking and enjoying the venues selected with VRBO/Home And Away. Usually forgo additional insurance offered due to the excellence of properties listed, owners proficient business practices, the rental site proficiency in administering their site, and of course, my personal honor, as well as that of my travel partners. I used HomeAway for years with no problems. Recently, though, it is become terribly frustrating. The fees, which seem very random and unpredictable, are not reflected in the price you see as you search for properties. What should be a simple search to find a place to stay turns into hours of clicking through to a final price only to discover it’s triple the rate you set in your filter. If this is intended to lure you in with a low price point up front, it’s having the opposite effect. Air BNB is much easier to use. I’ll check back occasionally on the reviews to see if this issue has been solved because I really have found great homes on here before. But, for now, I’m deleting. Not worth the stress. Simple and effective app. Love it. I loved using this app and website for the past 10 years. Until the fees. It’s cheaper to stay in hotels now and have them serve you breakfast. Now everyone is charging admin fees and the site is charging fees. By the time it’s all said and done, the price could be $200 and up more to stay somewhere. Now, I use Trivago and find better deals. When you want to nickel and dime everyone, we will look elsewhere to spend our hard earned money. Properties without a review are definitely hiding from the truth! If it has no reviews on the property!! Steer clear. Stayed at one in pompano and what a lie !! Do your homework because this app will hide the truth in what your getting into !! Jacked up fees and have to call for everything promised! Need better management! Send the reviews on HomeAway! Adorei! Fácil de navegar e muita seriedade, tanto pela parte do site como pelos proprietários. No option to filter out places base on minimum nights stay . Some times I'm looking for a week to two week , but are lead to places that has a minimum of 30-90 days ! How about hiding houses that you don’t want to EVER see again, due to low rating or misleading claims . Now they got rid of the dates on when the reviews are posted, How are we suppose to know if there was a recent issue on a place! No option to report false claim by property owner/ management . We had a great time at the house it was clean and well prepared and very close to everything that we needed. That is what you are , you practice rent seeking. This makes the booking process very easy and convenient. The app, and frankly the entire company, are garbage. The app is buggy and inefficient, but more importantly, HomeAway’s express and implied guarantees to its renters are worthless. HomeAway and one of their homeowners breached their contract with us by not providing us with running water for 4 days, and no potable water for our entire stay. They then refused to honor their guarantees and refused to honor the owner’s written promise of a refund for the 4 days we were without running water. Very dishonest, unethical. STAY AWAY FROM HOMEAWAY!!! The apps basic functionality of viewing and booking is okay, but as soon as you need to do other things (see your reviews, get help from customer service, etc.) it lacks. Who cares about the app is their customer service is ATROCIOUS!! 3rd attempt to use: A very nice house came up for rent on Maui. The ad looks suspicious. It’s eight $29 million house that they are renting for $1300 a night no matter what night of the year which is completely uncommon in Hawaii. The house is also for sale while it’s being listed for rent. The owner refuses to show any waterfront photos and only shows photos from the real estate ad which you could download from the Internet. When I tried to contact home away To verify the listing because it appears it could possibly be fraudulent, I got on the phone with a person who could barely speak English and sounded like they were from India. I asked to speak with the manager and waited a long time on hold and then was finally hung up on about 20 minutes into holding. This is the ridiculous organization. They repeatedly fail to manage their business properly. I will do everything I can to not use them but like the resources of of their website to find listings. 2nd attempt to use: We could not make our reservation due to the wild fire smoke since my husband was recently hospitalized for respiratory illness. The booker REFUSED to even ATTEMPT to re-book the house in the middle of August at the height of tourist season!!!! I find it maliciously UNETHICAL and am astonished that the booker and homeowner would be so foul!!! How Pathetic!!! 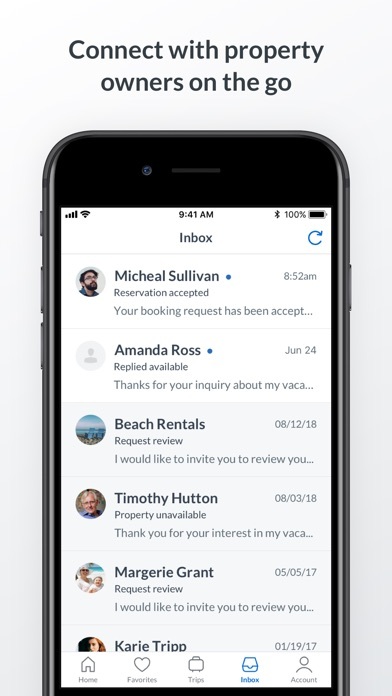 1st attempt to use: I rented a vacation rental through this app and the renter would not respond to my request for a refund so I contacted customer service for support. It took them a couple of weeks to respond to my inquiry!! And then their response was lame saying that they were busy! The only reason why I would book through a third-party like this and not directly with the property owner is for a sense of security. However, given this absolutely disgustingly atrocious customer service, I cannot recommend them or an app that supports them! Love this site over the others. Only part I wish they would change is to require houses that have pools to specify if they are heated or not. I have found out even the virtual assistant has been wrong by telling me a specific property doesn’t have a heated pool only to find out later it does. Otherwise it’s my favorite go to site! Our experience at this cozy and VERY CLEAN home was nothing less than perfect. We were not only able to enjoy the beaches, boat rental for the day, but also enjoy the home and some much needed family time. We brought our corn hole, grilled in the backyard, and were able to sit and enjoy a few family dinners. One of the best things was the location. We were not right in the middle of all the tourist areas, but able to enjoy them as we wanted. Several personal touches that made you feel welcome, as if you were at a home away from home!! Our family would recommend highly!! This is my second time using Home Away. It is so easy to use and I always find something different on their site. I’m extremely happy I checked here for our next vacation stay. What a wonderful easy way to book a cabin or any type of getaway, take a look at what you’re booking and where you’ll be staying, everything you need to know about the property, or you put in which you want in the property and I’ll let you know what’s available! Try it, you just might love it! It keeps telling me to try later??? Excessive and numerous add on fees. I went to Home Away after having a lengthy relationship as a renter with them. I avoided AirBNB because of their excessive fees. Disheartened to see Home Away is WORSE!! Will not have repeat business with Home Away because of the excessive and gouging fees. Very disappointed after having such positive feelings for this company. Should be a good experience for both renter and rentee/host. Assure you, it is not. I am so excited that I have been able to make a booking for this home in the summer. We will be able to spend 6 glorious week back in our native country. Not where we grew that was North of the Border but in just as beautiful a spot and with just as beautiful people!! Can’t wait to eat all that great food too- crab, Dover sole, gammon steak, Stornaway black pudding and my favorite- kippers!! Love your site and so easy to use. This is my first time using this app, and most likely won’t use it again if changes aren’t made on how they calculate the fees. I ended up paying twice the price advertised because of incomprehensible fees, which are not explained. Why not give the overall price instead of showing half the price, then charges double. This feels like a rip-off! I’ve NEVER had this or any kind of issue with Airbnb. 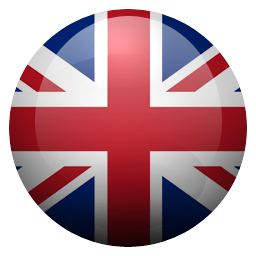 We have rented many flats and several houses in 5 countries through HomeAway. To date,we’ve not been disappointed. The pictures are accurate, and the details are true. HomeAway is the only way! We always find enjoyable vacation rentals using this app. It is fun to search all of the homes to find the perfect fit for our family. Your unrealistic fees will ensure this apps failure. Airbnb for my family! We use hotels when we go on family vacations, HomeAway is the only way to go! You get soooo much more for your money! I have used HomeAway on numerous occasions and always been satisfied with refunds on deposits, rental units and response times! In the most recent update, the trip boards tab does not work at all. So, I can’t see my saved listings. The cancellation policy should be easy, not hard, to find in the early info stages of the search. Prices are very deceiving. Sometimes as much as three times the “nightly rate” not worth your time. It takes 4 or 5 days to get bits and pieces of information. Never answer a whole question. Apple Apps says this app is no longer available...? What the heck is going on?!? Home away has become our go to place for finding wonderful accommodations when we travel. We have been using this app for our family vacations for going on three years now, and we have never been disappointed! The property managers and home owners have been great and easy to work with for each property we’ve rented. So grateful for my friend who introduced me to home away! 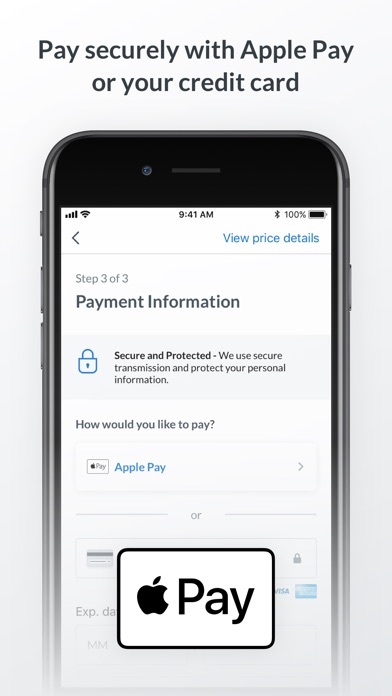 App design is fine but the way they hide fees is criminal. If you’re looking for 3 nights somewhere, and you find a place that’s $200 a night, then you would expect the total to be between $700-800 (the extra to cover taxes and a small fee or two). But the total ends up being $1100-1200 and they charge ridiculous fees. It’s unknown what these fees are even for. Service fees, administrative fees, waiver fees. They are all listed separately and are all $75-150. Craziness. Please be more transparent or take this app off the store. They cancelled my reservation and had it advertised on another site for the same weekend for double amt of the money. Fraudulent and a disgusting way to run a business! Not to mention nobody has gotten back to me regarding my refund. I would say don’t waste your money these people are SCAMMERS! Enzo’s apartment in Rome is full 5 stars! Perfect location and filled with all amenities - we felt right at home. The location was close to all the places we wanted to visit and very safe. We will definitely recommend it highly! Thank you Enzo & Carola! I look at one and after reading again it’s only a room in a house. Another has $55 for the nightly price and when I go to book it jumps to $165 a night! Disappointed to say the least!! I love using this app so much more than Airbnb! 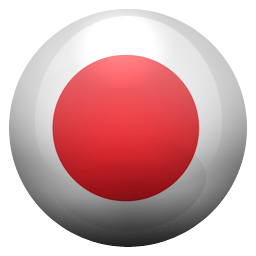 It is very user friendly and I get answers to questions right away! Personally booked homeaway about 6-9 times and always had a decent experience. Whether I’m in Maine, Spain, Canada, it’s so clutch to find a nice home versus staying at a high prices hotel, this way we have all amenities which is dope. Reviews would be more helpful with date of review, and more responses to negative reviews. This app makes using this wonderful website so easy. I love it. So far everything is working. Confirmation received...trying to get vehicles is a bit involved. Data for restaurants is coming. Site well layer out. Information not hyped...you get what you see. Owners have yet to respond to questions but that is understandable due to volume. Just booked my family vacation with Home away! So easy and fast! Trying to pick any one given home was really hard! There are so many beautiful homes to choose from in a big range of prices as well! So excited everything is all set for 2019 Summer vacation!! The app search feature sometimes doesn’t work. But when it does, it’s great. Can not log in on my mobile devices. I wish more filters were available for amenities. It is impossible to rent a home if you’re under 25. I have my own house at 21, I offered to buy insurance for other people’s homes and much more. Still get denied for being 4 years to young. It’s ridiculous. The whole process is fine but the end I was given the option to buy damage protection or be charged $1500 that I might not get back. Lame threat tactics that lessen my trust in VRBO. I really like how I was able to filter results fit exactly what I wanted which was a beach front property! Simple and easy to use. I found a great deal with all the amenities that I wanted and booked within a few minutes. We are using HomeAway for the first time. But it seems HomeAway might be related to VRBO, which we have very successfully used in the past for vacation rentals. Thus the 4 star rating. If all goes well with this use, I will try to come back and edit the rating. I have booked five times with this app. It is easy to use and all your trip information is saved. I enjoy the app but hate how you have to type where you want to go then it only gives you a list of that specific local. I like to look around and see other locations on the map but when I move away and hit list it goes right back to my first location. I contacted the agent to determine what amount I was going to be charged now. It was confusing on the website. It said the price would be split and I have no idea once I booked how much I was charged. Also, She showed it as a one bedroom and could not confirm what it said online, which was a two bedroom. She had to refer me to the home away customer support line, who then intern sent me to the traveler care center. I am still on hold after 15 minutes and can only say this is the first time I’ve had such difficulty with home away. Can’t log in or search as a guest. App keeps saying “oops” error. I’ve restarted, deleted and reinstalled but nothing works. So frustrated. I’ve used Home Away for multiple vacations to Maui. I have never had any issues, I will continue to utilize Home Away for future trips. So far every property we have asked about says they are not available on the dates we selected in the app. The app shows them available. It is a complete waste of our time to have confirm availability of every unit one by one. Immaculately kept, Beautiful decor, and outstanding service !!! We had the family vacation of our lifetime ! They don’t miss a single detail I can’t wait to book our next trip !!!! thank you Robin !!!!! Have used Home Away multiple times to book all over the country. Have not been disappointed yet. Artificial Intelligence nonsense answers as opposed to a real human being is very frustrating. If your not going to have people respond to questions, don’t even bother. The Artificial Intelligence works about as well as my Spell Incorrect. Have had all kinds of issues on 2 successive VRBO rental attempts. I would not use them. Waste a lot of time reviewing properties that have fees that significantly increase cost. And well organized - like the map draw function. I like an availability calendar so I know if a site is worth pursuing - I didn't see one. I’ve used Home Away for years and never experienced so many problems. Now when I try to access my trips and I get an Oops! message. Very frustrating! Thank goodness I had the last property owner’s phone number to text her for property access. Now, I can’t leave a review for the last property either! The fees have become ridiculous and are very deceptive. The nightly average listed under each property is an utter joke. Even the base price without fees during the off season is nowhere near the nightly average posted. Get together HomeAway! Or this long time customer is going to have to find a different vacation rental resource!! The iPhone app has issues. Doesn’t display my photo. Can not navigate the site. Dud. I’ve deleted and reinstalled a few times still no solution. Means I can not rely on the iPhone app, must desk top for assurance and navigation. We love this site and now we never want to stay in a hotel - Ever Again !! Love this app! Booking in the next few days! This our third time booking with Home Away. So very easy. I am a regular user of HomeAway and appreciate their service however I have two major issues hat I believe will be their downfall if not addressed: 1. Fees are not transparent and are becoming out of control. Rather than recognizing the opportunity to compete with the Airbnb’s of the world on fees it is as if they instead just jacked up fees across the board. Further, because the “price per night” does not include the fees and charges across properties are inconsistent, the search experience is much more time consuming and frustrating than it needs to be. 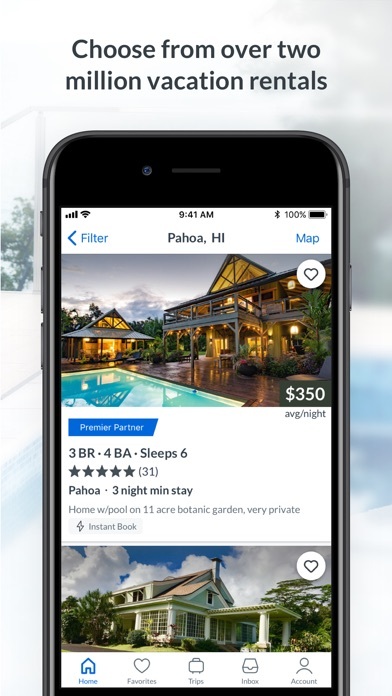 HomeAway should provide the option to see price per night with fees as a search option at a minimum which would at least increase transparency. 2. The app is buggy. This is in acceptable for a product/company at this scale. Get it together and only release updates when they’re properly tested. Simple features like “favorites” are not synchronized at times with the desktop. The funny thing is that this wasn’t a problem until they apparently recently updated the app because I used it in the past. The share favorites with someone has disappeared. The “draw area” for search (a nice idea) causes the app to crash regularly. None of this should be happening for a company like HomeAway. We stayed at Solare Tower room 706 and I woke up to multiple above bed bugs and blood stains on my sheets. When we reported it and employees came to inspect they found more bed bugs crawling around and they took pictures as well. I have video and photos. We came from San Antonio to celebrate my uncle’s 45th birthday and it was ruined because of this experience. There were no other vacancies so we had to find other lodging on our own and were turned away by many places because we only needed two days now and most will only rent for a 3 day stay. We spent hours looking for new lodging. I have bed bug bites on my body and scalp. My mother also has bed bug bites on her body. My uncle’s partner also has bed bug bites on her body. I already have sleep issues and this experience has aggravated those issues. Now I’m afraid to sleep at our next rental because I’m afraid of bed bugs. I’m also concerned about the three households that we will return to. Will we bring bed bugs back home with us? I hope not, but it’s possible. We, a family of four had to inspect every article of clothing and spend hours in limbo. We didn’t have a place to stay. Staff was unhelpful. We had to find a new place on our own. Our first trip to Padre was ruined because of this experience. We drove five hours to get bit by bed bugs. Went in a trip to Hawaii that has been booked for months. Stayed at a beautiful ocean front house. Unfortunately a category 5 hurricane is heading directly here now. When we were discussing the matter with the agent trying to find a solution because we are scared for our lives. The gentleman has the audacity to say we can not accommodate for inclement weather. All we wanted was to have him find us another place to stay. The gentleman then told me to speak to him with respect completely disregarding the worry in my voice. Mind you the house is less than 25 yards from the water and currently the direct impact for hurricane lane. Inclement weather is rain, snow or just non-vacation weather. Inclement weather is not a category 5 hurricane. The person I spoke to should be striped of his job because he is the poorest customer service representative I’ve ever spoke with. Now me and my family are sitting 25 yards from the beautiful ocean waiting and hoping for a safer place inland. The best quote from this foolish man was there is nothing we can do. There is nothing we can do. The HomeAway app is convenient, but there are a few things that could make it better. One very important thing that HomeAway needs to do is punish owners w a fee for not updating their calendars on a regular basis. The calendar/app says the property is available, so you submit a request. It can take a day for them to get back to you to say, “Oops, sorry, our days must be crossed. Can you shift your plans ahead 3 days?” Sure, I’ll just call the conference and tell them to postpone everything. And this happens over and over and over until you’ve wasted a week trying to book individual properties. In addition, the search function needs to be improved. It doesn’t include all possible properties, even though they make you think it does. For example, Pasadena & Altadena CA are adjacent cities. If you do a search for Pasadena, you might have 5 Pasadena properties & 1 from Altadena. This leads you to believe that there’s only one in range in Altadena. But then, do a separate Altadena search, and it gives you 4 additional properties! There’s got to be a better way to do the search on your phone. There is no way to scroll down in the app to read ALL reviews. You have to go on a pc to the vrbo site to see all the reviews. This is a critical feature that is needed because not everyone has a pc and depends on the app. Very important review information is not seen and this is supposed to be one of the features that’s makes your site appealing. Also you can’t vote on helpfulness in the HomeAway app like you can on the vrbo website. This too is very important as owners can upvote good reviews by using other email addresses to push the good ones to the top. This is what is first seen when you go to reviews in the app. Again another reason why expoaing all reviews in the app is critical. We now have to pay a fee just to book with the site. So it’s time to start delivering features that allow a traveler to make the best informed decision. 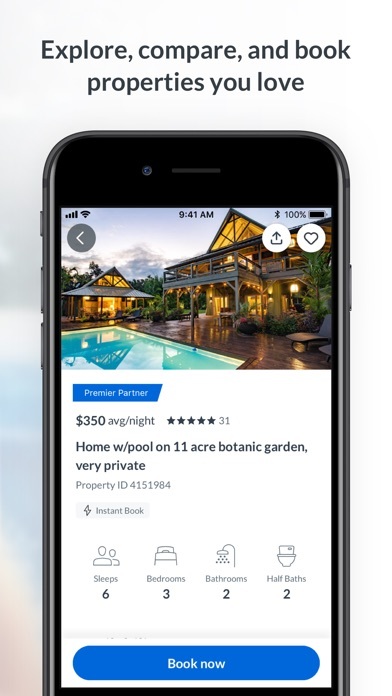 At some point not exposing all the reviews in the app is likely going to result in liability to homeaway if a decision is made on a property that had the information in a review that homeaway didn’t expose. After booking previously without issue I found a rental through Home Away for a trip to Vancouver this past summer. I booked and was approved, then the renter contacted me outside of the app and asked to transact directly. It’s a VERY long story but I found this suspicious and asked Home Away for advice and if this was against their policies. Home Away responded that it was not against their policies and that the renter had great reviews and told me not to worry. Long story short, the renter is a HUGE scam artist who took me and many other Home Away customers for a ride. I was able to get a refund, and found other accommodations at 10:00pm at night in a strange city. I did however lose a lot of extra money due to a last minute desperate situation, I was put in harms way because of my dealings with some seriously shady people, and Home Away did NOTHING to help before or after the fact. I have contacted them after the event and sent details and further proof that they had done me and other customers a disservice. I guess they are too busy to be bothered because they never even followed up about my concerns. I will never use this service again. Incorrect or out of date information. I gave a 2 rating because we signed up for a property and found out the next day that the owner did not have it available at all and was unaware it was being shown on the HomeAway or VRBO sites. Luckily we were able to find another property for the same 2-day weekend, but the cost was $500 more and not as good a fit for our family. While completing the process of that reservation, HomeAway offered damage insurance to finish the payment but I thought I had seen a damage waiver cost in the original fees. The website didn’t allow me to go back to look at the previous steps to review before making the decision about damage insurance. Fortunately, a quick reply to a query I made to TurnKey explained the TurnKey damage waiver policy, so I was able to make an informed decision. We had a bad experience with a HomeAway rental in Montecito CA last year for a wedding in Santa Barbara. We documented our complaints for that experience. We are hoping for a better result this time in the same Santa Barbara area. We will be happy to raise our rating based on a better experience. NOW HOME AWAY! Expedia aka Home Away charges a “service fee” to the renter(s) based on the price/day x total days you’re booking it for. VRBO let owners post vacation rentals & renters could contact owner directly. We did this for many years for 2 condos in Maui. I recently booked 2 different condos (prior condos were sold) and one owner used a Real Estate company’s property management to handle payments & other “vacation rental” needs on the island as they reside in Washington. Unaware of this till way later. I HAD to enter my cc info to reserve, Home Away bam gets their fee. It also said full payment due at time of booking. Done. NOPE! Got confirmation email from Home Away stating payment received a few times. Days later I get email from H A requesting payment. Then from the property management that I knew nothing about! What a hassle. Because H A stated “full payment at time of booking” and I had a difficult time getting direct contact info for the owner from H A I just found this to be such a hassle! HOME AWAY, owner info needs to be easily accessible with their rental posts! You don’t own these properties!! Just be careful fellow travelers. I was booking a cabin for a nice week getaway and the owner offered to give me a payment plan. He set up two payments and altered the price to what I’d be paying that day. Once I used the link provided for me, I put in my card information and the booking agency double charged me! I notified them of the problem and they placed a hold on my account. They said it would take 24-48 hours for them to let go of my money!! I went to the bank and the supervisor there said that they could get the money back to me quicker and all that HomeAway had to do was fax over a company letterhead stating that it was just a hold and that it is being released. I called HomeAway back and they said that they “ couldn’t “ do it, and that they don’t have the resources to. I was on the phone with representatives 7 different times just to get that answer. One representative even hung up on me. My money wasn’t release until 3 days later. The representatives that I talked to were very rude and unhelpful with the exception of one of them. I genuinely would not recommend this booking agency at all. We don’t care for having to put in our credit card info, just to confirm dates with property manager, then getting charged for each property inquiring on. We had to provide the info, in order to hit send for our message. Originally, we booked & paid for one property. Money came out, we got a confirmation & we thought we were booked/confirmed. But, we got a notice of a refund & a message from property manager/owner that the dates were actually not available, even though the online booking system said that they were & allowed us to book it. Not very happy that happened & that we now have to wait for our refund. So, that is why we are now asking for date verification!! We should not have to have our credit card info charged, until we’ve settled on the property we want. They are booking fast for June and we had to do multiple date availability confirmation requests. Has to be a better way, like it used to be. 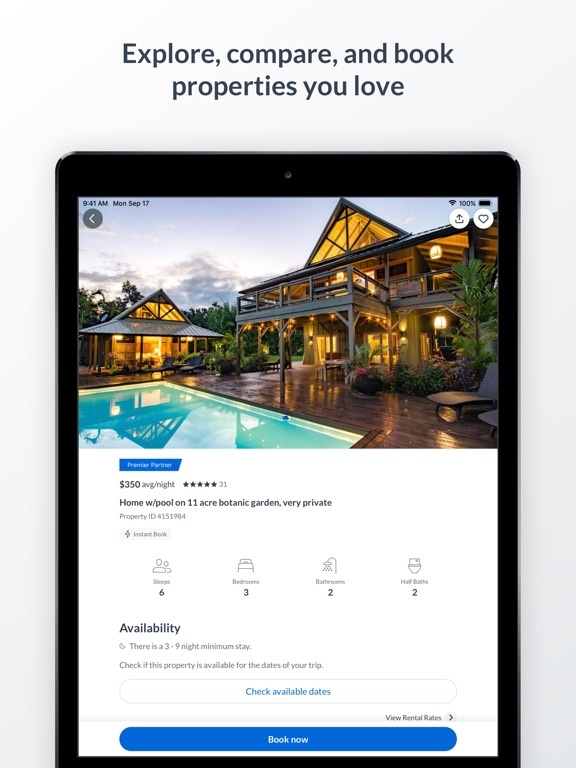 HomeAway is my go to app for all vacation rentals. I have used the app for several years for houses in the Rocky Mountains on ski trip to beach getaways on the East Coast. 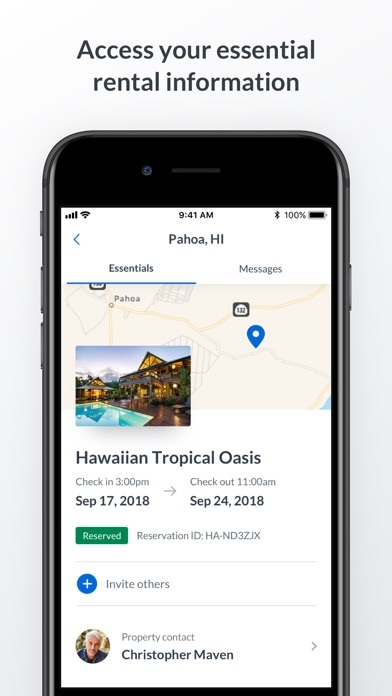 The app is incredibly user friendly and makes communicating with rental owners about payments, check in procedures and check out a breeze. Recent searches, favorited properties and past trips are saved automatically which helps when looking through the endless options available. Other user reviews are extremely helpful when scoping out your next vacation spot. All properties I have rented through this app have been exactly, if not better, than advertised. In short...I’m hooked on HomeAway. Thank you for making a potentially stressful activity the last thing I worry about every time! 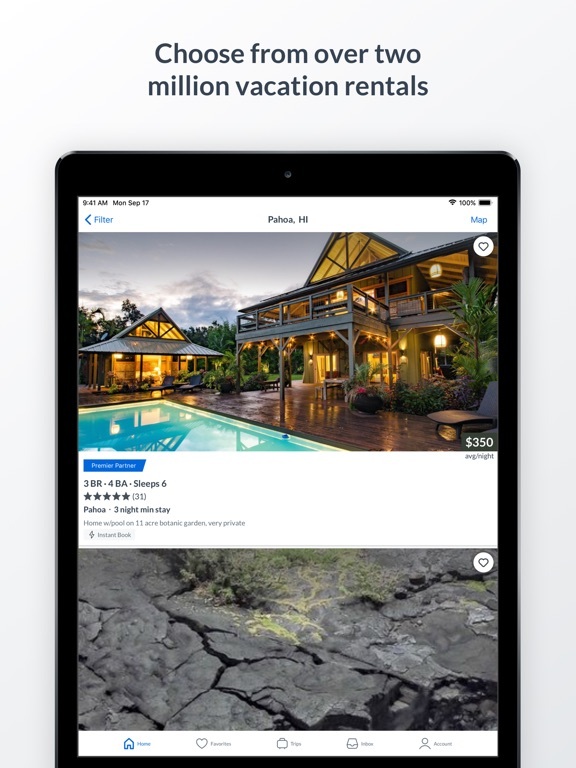 It used to be easy to find an apartment, condo or house in the HomeAway app. In the last year, it has changed. Many listings are now for a room in a house (a la AirBNB), but there is no category for rooms. People list them as a studio, or more often as a 1 bedroom/1 bath apartment. Some people are listing each bedroom in a 4 bedroom house as a house (shared bathrooms and kitchen?! - I don’t want a dorm room!). You often have to wade through half the description to find out what is really offered. They have also added motel rooms. And, lastly, some have “kitchenettes” that are nothing more than a dorm fridge, sink and a microwave. There are also RV parking listings, no RV - just a spot on their driveway for $27/night! And an old single-wide mobile home where the owner and his dog would move to a neighbor while you are there - nicknacks, stacks of mail and dog hairs included at no extra cost... I’ve also found that prices are much higher this year, often 30-40% higher than equivalent places in past years. 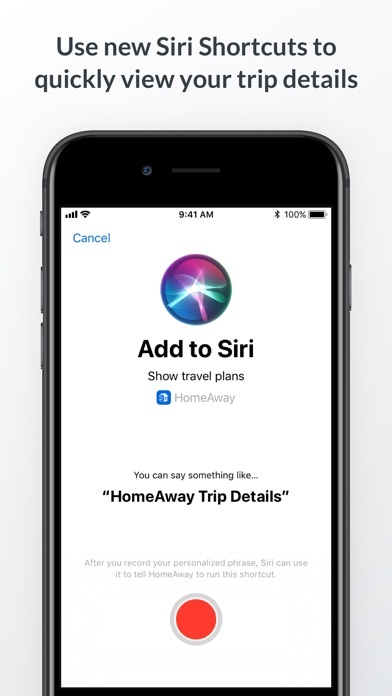 Searching always defaults to “HomeAway Sort”, rather than staying in the category you have used previously. It’s annoying, and requires more keystrokes. HomeAway needs to tighten up their policing of entries and improve search parameters, or they will lose customers. I am almost gone. I have a large family and we do our share of traveling. If you require more than one hotel room things get very pricey. I'm top of that, there are no "common areas" to visit with family in most hotel rooms. I love this app because it allows me to reserve homes or condos with multiple bedrooms and bathrooms to accommodate my family for a fraction of the cost I could pay at any hotel. Every reservation I have made has turned out wonderfully! The reviews are very helpful, and the rates are astounding. I recommend this to anyone traveling out of their home area for more than a couple of nights. You will save money and recognize so many more benefits over staying with a hotel! App is very user-friendly. Barrier Island Retreat is a wonderful place to stay. Two of my daughters and I enjoyed our long weekend getaway so much. This apartment is adorable as well as comfortable, and the owners Deby and John are awesome. They do not hover around, but are always available and very knowledgeable about the area. The location is great, access to the beach very easy and just a short drive to St. Augustine makes Barrier Island Retreat the perfect place to stay. Not having a full kitchen was no problem for us. A very nice grill was available if we had chosen to cookout, but the refrigerator held all the cold foods we brought along and we brewed tea in the microwave. We do plan on making this place one of our go to, home away from home. Thanks again for a wonderful visit! We were blown away when we walked into this beautifully appointed guest home. There was nothing lacking and everything was pristine, new, and of highest quality. Joerg was an outstanding host and was gracious about letting us stay another night. We certainly hope to be back. Plenty of room for privacy and to stretch out with 3 full bedrooms and baths. The hot tub and sauna are in the guest house, although the salt water pool is part of the main house. Property is less than a mile from a wonderful breakfast and lunch cafe, although the refrigerator and pantry were full of breakfast supplies had we chosen to make it. There was both an Expresso and a coffee maker. Just cannot say enough good things about this wonderful place. Please make owners update availability! My wife and 17y/o son stayed at Casa de Banta for the second time during the last week in June 2018. It was the BEST HomeAway experience we have ever had. David & Libby were very accommodating and had some great restaurant recommendations. There were plenty of kitchen appliances, towels, and very comfortable furnishings. The outside patio area was a great place to have breakfast every morning and a glass of wine in the evening. It was nice having parking that was onsite in the middle of town. Walking distance to everything except to the beach. We will definitely be returning as St. Augustine is one of our favorite getaway places in Florida. I couldn’t of asked for a better way to spend my 60th Birthday! Our stay in Vernazza at this property was great for the following reasons. The place is very clean, even the comforters smelled like they just came out of the dryer. Towels and bed linens were starch white. Pillows and mattress were very comfortable. The property owner was attentive to detail, leaving extra toiletries, kitchen items like teas, snacks, etc. We had plenty of towels and pillows, comforters. The owner has great communication and tells you how to work certain things. It's very easy to find and very close to the train station. For a family of 5 we were surprised at how roomy the place is. You will not be disappointed if you stay at this place. We dealt with an issue on our stay with cleanliness and then with our safety and being harassed by an employee on the property after trying to address the issue of the house not being clean. Home away security and customer service have done absolutely nothing to resolve this issue. they could not get me any kind of refund even after hours of phone calls and emailing back-and-forth with customer service sending in photos of The employee harassing my personal Facebook weeks later. I am blown away by the lack of customer service. this is a hospitality industry you should care if your customers stay in a clean and safe environment. Home away claimed they are just a online booking platform and have no responsibility to anything that happens to the customer during their stay. Very concerning. Blue Nest ‘ is definitely a paradise for a peaceful , quite wonderful vacation for the whole family ... this beautiful house has everything you could ever imagine , just pack up & go , the deck is outstanding with his view , we spent just about our entire time out on the deck for breakfast - watching the surfers at sunset , brunch and evenings just absorbing the gorgeous ocean view with the relaxing sounds of the waves .. it was for my Sons gorgeous beach wedding which was located next door to us , very convenient because we had several elderly people staying with us , the owner & management staff was excellent in every way ! I have been using HomeAway/vrbo since at least 2007. All but one of our experiences have been great and without issue, but recently I’ve noticed a pattern of increasing fees in all of the fee categories pet,cleaning,service fee, etc. I feel that an advertised price of $175/nt should not turn into $300 plus and it has, with increasing frequency. This inappropriate greed will cost this industry and its people in the long run. I hope that HomeAway will address this or change its teaching in the workshops it offers to property owners. There are a lot of good people still on here but just be aware of everything and not just the cost per night you see with the picture of the property. Not user friendly! Profit based! I am hoping some developers will start making 3rd party apps to replace lame apps like this. VRBO has already cheated its hosts by defaulting on prepay contracts and a company mission of. 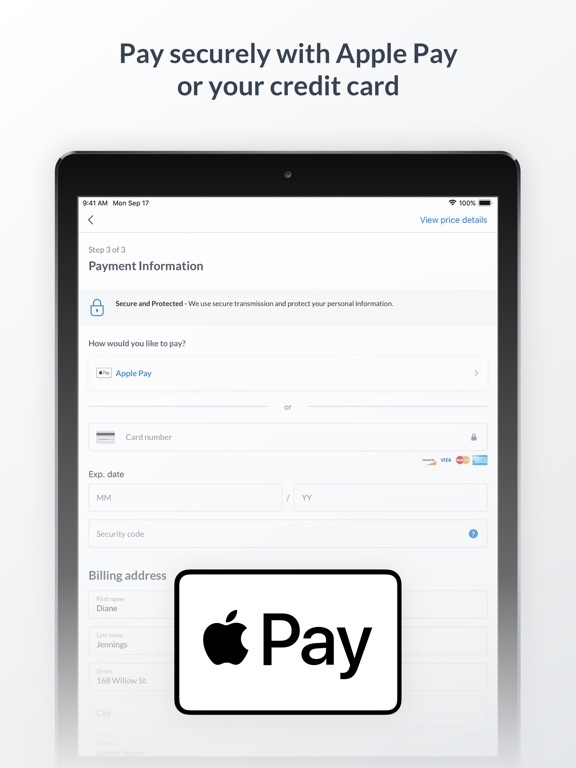 A prepay platform. Now they are making local map searches very difficult with hidden map functions. Hosts want my and pay for a local geographical searchable rental. What a bummer to pay a company for marketing your rental, only to find attempted searches suggesting other rentals outside of of your area. We have about 19 rentals in the Big Sur area and VRBO shows 800! 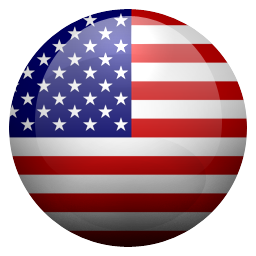 This last version requires reconfiguration of map, filter and outline function nearly impossible for the average user. More inventory in an area means more sales and fees for VRBO. A convenient result of NOT updating means no map or search functions. Most people do not update apps that often... especially power users that might be able to figure out the later lame versions. I am trying to push people over to airbnb platform, but they have done the same sneaky “updates” for profit gains. You might ask how suggesting an area NOT asked for will benefit a traveler or a host! Both end up disappointed, with no refund options. I used to use Homeaway and VRBO all the time. The last couple times though have been very frustrating. The fees aren’t obvious... and aren’t a small matter... a $250 a night (2 nights) charged my credit card for $1259. Of course that includes a cleaning deposit that will be refunded- but since I am not staying until next summer... that is a whole year where they get to use my money. Second, and more importantly, this is the second time in a row that I have been notified by the owner that their fee schedule wasn’t up to date. So instead of $250, it is $450 a night with a 4 night minimum. Meanwhile, I am getting confirmation emails from HomeAway and telling me I am booked. Can the owner just arbitrarily increase the price like that? Am I booked or not??? This is not worth the hassle. I made a reservation without creating an account, which just asks you for your email once. Having done that, I reserved and paid thru Apple Pay, and was informed I would be notified if the owner confirmed the reservation. I never received a confirmation, then later found out I had still been charged $400 because the owner confirmed, but I never received the confirmation because I made a typo when entering my email. The app only asked for my email once, never had me re-type it, and did not do anything when they received bounce-back messages for the email address I accidentally did enter (I misspelled gmail as gamil). They still charged me the full amount and made no effort to make it right or change their protocol to protect others from this happening. I love VRBO and Homeaway. We’ve been using both for many years and have great memories vacationing at a comfortable home in plenty of towns and cities. We take our dogs when it’s a drivable distance so I love the pets accepted filter option. 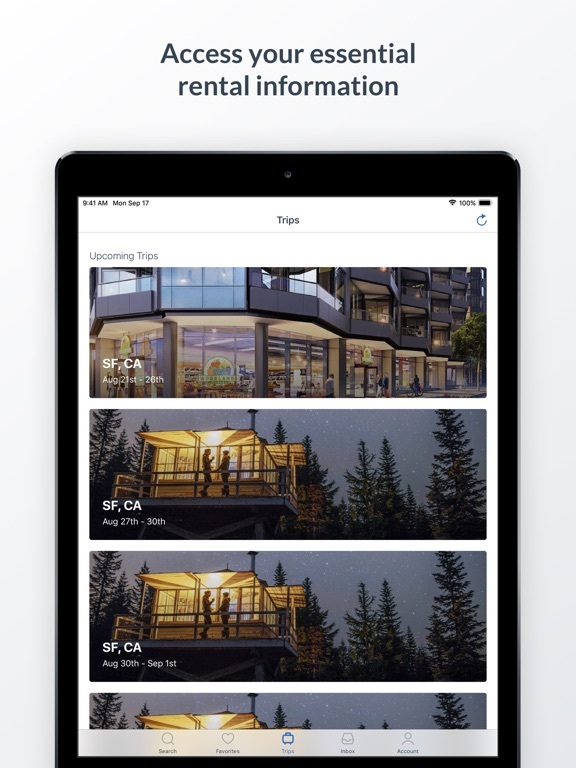 Being able to create favorites folders when searching for an upcoming trip works great, but not being able to create new folders within the app is a big miss. 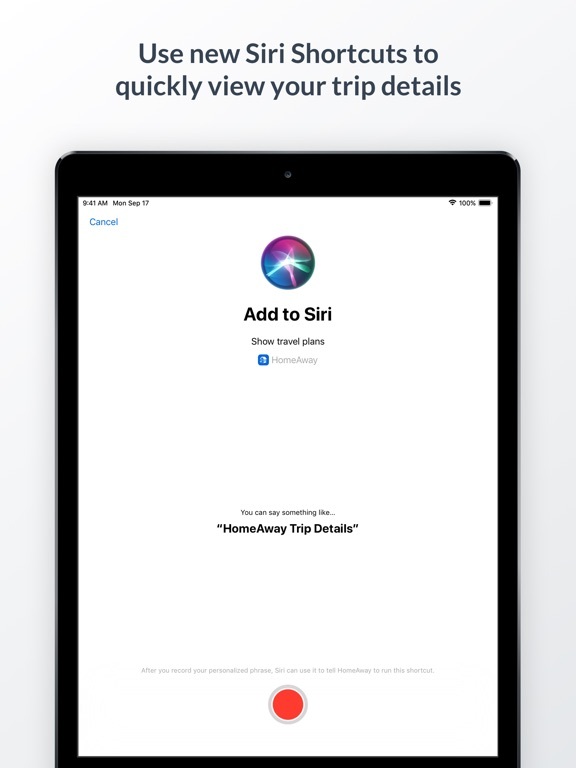 A user must login on a computer in order to create a new destination favorite folder to be able to save properties from the app. This feature needs to be added to the app. I reserved HomeAway location which I had to cancel due to work relocation. I have my cancellation request but was charged as a "no show". I've been trying to reach a resolution for months now. I have the hardest time reaching someone regarding my refund. The times I have spoken with someone I was told the issue would be resolved. I've been dealing with this for at least about three months now. I feel no closer to a resolution and don't have much faith I'd ever get this resolved. Despite the issues I stayed at a different HomeAway Location, which I loved. I was told my deposit would be issued shortly after my stay. When contacting the home owner I was told I should've received my deposit weeks ago. Still I've yet to get a refund for my cancellation or my deposit. I input my dates and price point before searching and it returned a number of properties. However when I tried to book a certain property the price jumped from $225/night to $395/night before taxes and other fees!!! When I called the reservation number I was told that the price change was the price for the days I selected. It seems to me that if you put the dates in before you search then it should show you the actual price of the property for the dates you selected - not the price for some other date. Apparently it doesn't work that way which makes the website fairly useless if you're searching for properties within a defined price range for specific days. Disappointed with this service to say the least. We thoroughly enjoyed our stay at this cabin. It was so comfortable and homey and you could tell that the owners take great pride in making their home beautiful for renters. It is spacious and well stocked. Our grandkids played the board games every day. They especially enjoyed lively games of Life and Monopoly. They brought their inner tubes and floated down the stream and swam and fished at a secluded beach. They were especially competitive golfing at Priest Lake golf course. Oh, yes, we are now addicted to huckleberry milkshakes. What they said when we left?....”This is what memories are made of!”. For our 50th wedding anniversary this home provided a wonderful retreat for our two adult children and their families. The dock/lake had special appeal for the fishermen, the fooze ball table a delight for the child, and the natural surrounding beauty, peace and quiet, and comfortable home had special appeal for the women. The joy of being together was heightened by our visiting the Hiddenite museum, sluicing at the gem mine, touring the the distillery, and driving through the zoo/park - activity information included in a notebook provided at the house. Good memories created during our stay. Thanks again. My Wife and I like to have a family vacation and with Home Away,they make it so easy to plan and travel. This year will be our 7th in a row. It is so easy and convenient to use the HomeAway app. Cape Coral Florida again as we never get tired of the fun and sun. Unlike the cold and snow for Michigan winters. We are planning to take the family to Disney Wold in the next few years and maybe even to Hawaii for my retirement vacation!!!! You cannot have an easier booking experience with anyone that compares to HomeAway. I was having trouble finding places last minute in Maui and Oahu. Air BNB was coming up a bit short so I thought I’d try something else. I was surprised to have found lots of good rentals within my budget range. I found the layout and presentation — not to mention the fluidity of the app — very easy to navigate and comprehend. Thought I’d end up booking at least one of my two rentals on AirBnb, but looks like this has become my number one option. Appreciate the service — thank you!! This apparently is a scam site! I booked a property got a confirmation email and 3 days later i got an email saying this property only did Saturday to Saturday. I searched more and found another one. It gave me instant confirmation. They took my payment of $2400. Got an email 2 days later they canceled yet again. I called to see what’s going on because the money was already taken out. The representative said she couldn’t help me I would have to call back in a few hours to talk to someone else. I asked if they could call me back and no they don’t do that. So now they have already taken my money, we have no where to stay and now I doubt they will have anything available. I would NEVER book from here again! The only issue I have with Home Away is that I have to give credit card info before I know if I have the rental. Other rental sites show what dates are available and I like that transparency. Home Away feels a bit like the owner can discriminate if there are multiple applicants for the same request. I have been turned down more than once for- “I have another party also interested in these dates”. Then I have to wait to hear that my credit card wasn’t charged...but my info is out there. I recently stayed at this resident in June 2018 for my birthday weekend l. The house was awesome it’s every women’s dream house. I arrived a few minutes late. But check was easy and very accommodating .Once inside I found everything to be very clean it was a quite area. You can find everything in the area Don let us know there was a Walmart 7 minutes away which was very helpful. I will definitely tell you if your looking to book this retreat don’t hesitate do so it is well worth it. This app makes traveling so much easier. I am never searching for the address of the place we are staying because it is in the app. All of the information about the booking is included in the app (how to get in, special instructions, etc). The app even will let you know information around the area. It is so handy to have everything in an app so I am not digging through my emails or printing the info. Thank you!! Inconsistent app. Maps are great, but constantly changing app makes it difficult to use repeatedly. I have had repeated problems adding listings to my favorites lists ~ works sometimes, does not work others. Now I can not find cancellation policies on any properties I am considering. Cancellation policy has always been listed in the subsection on rates and other charges ( ie. for greater than 4 guests). I have had to message the host requesting information regarding cancellation policy first, rather than just filing a request to book now. They are not honest. Stay away. I have booked an apartment to stay in Madrid during Christmas in July. Only now, they gave me the address of the property. When I see images of the property it’s totally a mess. A building under renovation. They have removed all details of the apartment from the website and the owner refuses to respond to any messages since October. When I asked them for a refund, they totally refused and say that if the property is not to my liking after I reach there, they will find another property that is available and house me there. The managers are rude and not helpful at all. I feel that I have made the biggest mistake of my life by booking a property with them. Beware. Do not make the same mistake I did. I tried to reserve a place online and began having issues every time I went to hit “book now”. I then proceeded to call the number that was listed on the webpage. After 20 minutes of talking to 2 different people and not even getting past spelling my name 8 different times, I hung up. Jumped on the app on my phone and had the place booked in less than 3 minutes. Guess technology really wins here. I wish you could have a max number of stuff instead of 2+. Like if I want a 1-2 bedroom house instead of just 1+. This stinks because I want a one bedroom place but I get stuff that is 1, 2, 3, 4, bedroom place. Or select how many people the place sleeps with a maximum entry. I guess the first star is for round the clock access to customer service and the second star is for some other aspects that make the website easier to use. Also it seems like there are more fees associated with the rentals than there were a few years ago. Not sure if there is anything to that but that’s the way it feels to me. Search filters not always accurate. When searching for a rental house, the app lets you specify many search limitations to find appropriate matches, but then it returns listings that don’t match the filters. Rather frustrating. The website seems to be much better than the app. And there is often incomplete information, like what the exact bed situation is (bed size in each room). I can’t imagine any potential renter not wanting to see that specified. It should be a required field on every listing.